Product prices and availability are accurate as of 2019-04-12 02:27:43 EDT and are subject to change. Any price and availability information displayed on http://www.amazon.com/ at the time of purchase will apply to the purchase of this product. 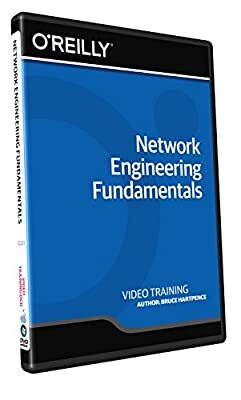 Need a basic primer on networks? In this video, network designer and teacher Bruce Hartpence presents an introduction to networking for those who are just getting started or need a refresher. You'll come away with a broad understanding of how networks operate and what's required to build them, along with some knowledge of how to use specific tools to build various topologies. Bruce introduces network standards and vendors, such as ITU-T, IEEE, IETF, Cisco, Juniper, and Avaya, as well as various network components including the Network Interface Card (NIC), access points, routers and switches. You'll also learn about: - Local Area Network (LAN) Protocols such as Ethernet Type II and 802.3 - Small wireless networks, including WiFi and 802.11 - Internet Protocol (IP) and Address Resolution Protocol (ARP) - Internet Control Message Protocol (ICMP) - Internet Protocol Versions 4 and 6 (IPv4 and IPv6) - Subnetting and Masking - Network tables and their operation - Transmission Control Protocol (TCP) - User Datagram Protocol (UDP) - Spanning Tree Protocol and RSTP - Virtual Local Area Networks (VLANs) and trunks - Routing protocols such as OSPF (Open Shortest Path First), Routing Information Protocol (RIP) and a small dynamic routing topology Bruce Hartpence is a faculty member in the Golisano College of Computing and Information Science at Rochester Institute of Technology in New York. He currently teaches in the areas of wireless communication, voice over IP, and network design. He also runs an industrial training program in networking. Bruce is the author of Packet Guide to Voice over IP, Packet Guide to Core Network Protocols, and Packet Guide to Routing and Switching (all O'Reilly).